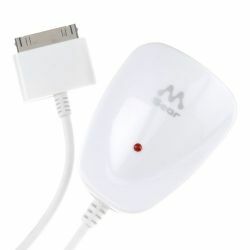 Charge your iPod & iphone on-the-go with the Merkury Innovations iPod Travel Charger. The charger lets you charge your iPod, iphone using a standard wall outlet when you are not near your computer. The charger is compatible with iPods with 30-pin connectors and features a charge indicator light that illuminates when your iPod is charging.